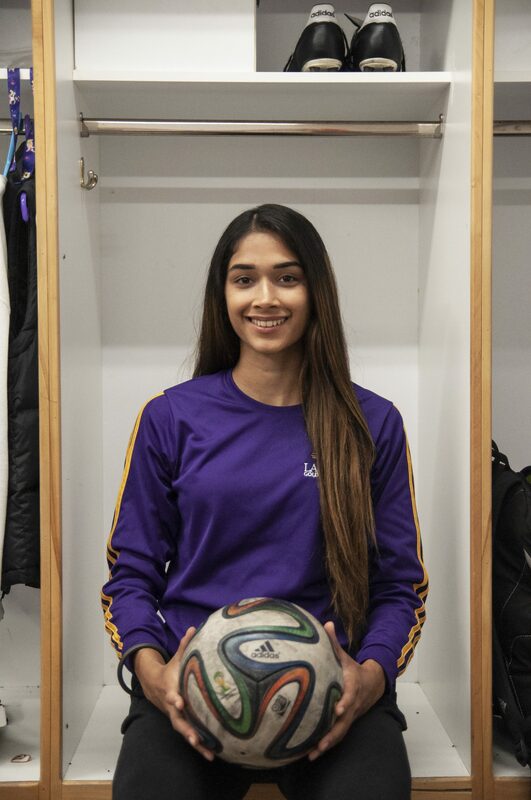 A humble leader, Gagan Parhar enters into her fourth year with the Laurier Golden Hawks women’s soccer team with a new confidence and high hopes to help bring her team to the OUA championship finals. Parhar is fresh off of being named Female Athlete of the Week, and is the current leading scorer for the Golden Hawks. “Anyone could have scored it but I was just there in the right time, right spot,” she modestly said about scoring the game winning goals during two games against Algoma. Parhar did not intend to play those games due to a persistent ankle injury; however, she dressed and warmed up with the team just in case. Within the last 10 minutes, Parhar entered into the game and she scored the game-winning goal. “There’s nothing that I did myself, it’s a team effort that it comes from,” Parhar said. Her modesty is a testament to the player that she is. Throughout the interview, Parhar could not help but to acknowledge that her personal success as a Golden Hawk would not have happened without the support of her teammates. Parhar began her soccer career at only four years of age. Both her father and brother were very invested in the game, and “it was something I looked forward to doing,” Parhar stated. She said that by grade five she knew she wanted to play soccer for the rest of her life. When entering into high school, her goal while playing was to attend a good university with a great soccer program, and to receive a scholarship. Needless to say, she reached that goal and surpassed it. Her efforts do not come without work. Parhar said she worked hard this summer on her shooting and finishing which has increased her confidence going into this season. When asked about her personal goal for the rest of the season, she said she wants to “continue to be a leader for the team, and just motivate [her teammates].” Parhar also hopes playing soccer motivates and inspires young soccer players, especially in her Indian Punjabi community. When they see her play she wants them to take away that “anything is possible,” and nothing is in the way of achieving and pursuing their dreams. There is no doubt that Parhar and the rest of the Golden Hawk women will continue to execute and perform as they get higher in the standings and closer to the finals. The women’s soccer team will take on the Warriors next in the ‘Battle of Waterloo’ as they look to gain some momentum. Kickoff is set for 6:00 p.m. on Oct. 3.